One of the great things about translation is its sheer variety; one day you’ll be translating manuals of a washing machine and the next the website of a hotel on a dreamy island. Besides keeping boredom at bay, this multitude of subjects helps you learn a great many new things you would never have imagined existed. Naturally, if you specialize in one sector, that aspect of the job can get lost, but not entirely, as almost every new job and text brings with it new concepts and structures to be decoded and interpreted. First and foremost, translators are language professionals, so one of the things we tend to like the most about our job is language itself. When you translate, you get to first decode a message written in one language –or code system- and then re-code it in another one. Through this process you learn a lot about both languages, you sharpen your skills in both and, most importantly, you get to marvel at the magic of multilingualism! Language is the main means of expression of culture, so when translating something from one language to another, translators actually bridge the distance between different cultures. Think about all these books you would never be able to read or the plays and movies you wouldn’t be able to watch and enjoy were it not for the passionate translators who painstakingly render them in a language you understand. We love this role and for many of us it’s the main reason we got interested in the profession in the first place. Granted, not all translators work from home, but there is quite a large percentage that do. The freedom of working from home can be great: your commute is only from your bedroom to your desk; you don’t really have to get dressed if you don’t feel like it; your working hours can be as flexible as you want them to be; you get to meet friends or run errands in the middle of the day, or to have long breaks whenever you need them the most. Today, computer-assisted translation tools are more advanced than ever. Translation memories are probably the most useful invention in the translation sector. Especially when dealing with repetitive texts, being able to retrieve previous translations with the click of a button can be a huge relief when you are pressed for time, while ensuring consistency and uniformity. And that’s not all: CAT tools help us avoid errors in numbers and other untranslatable text and spot other types of errors or missing translations. This is usually the number one complaint of professional translators and is due largely to the advent of machine translation. However, it is also due to a long-held belief that translation is nothing more than substituting a series of words in one language to a series of words in another and can be done by anyone who speaks a foreign language and owns a dictionary. This has consequences for our remuneration, as people tend to expect much lower fees than what is reasonable, but also for the status of the translation profession in general. Professional associations, conferences and articles online are some of the ways the sector successfully combats this trend and increases its profile. Some clients unfortunately realize they need something translated at the last minute; others tend to think that translation is a quick and easy process that can be completed in a matter of minutes: both situations that lead to suffocating deadlines. The reason we don’t like tight deadlines is mostly because high-quality work is our top priority; and the less time we have for researching, translating, editing and proofreading our work, the more chances there are of errors in the translation. This is actually more of a love-hate thing; most translators will tell you that there is no such thing as an untranslatable concept, and that’s true, because with the right skills, patience and imagination you can always render something in another language. However, especially when specific terms are concerned (i.e. legal or technical), this process can involve a lot of research and can be extremely time-consuming. On the other hand, the feeling of satisfaction you get when you’ve finally found a solution you’re happy with is priceless. Plus, as we mentioned above, we love learning new things, and doing extensive research is a big part of that. The isolation that working from home entails can be hard, especially if you have an outgoing personality: it can get lonely; you tend to miss the chit-chat with other colleagues; after a few years of freelancing, you may actually start missing the ritual of getting up and getting properly ready for work each morning; your personal space and work space are often one and the same, making it extra difficult to disconnect and balance your personal life with your professional one. Only a few years ago, translation was done with a pen and paper or maybe on a simple word file on a computer screen. Today, professional translators must have good knowledge of at least a few translation tools, know how to troubleshoot them, make the most out of their features and avoid their pitfalls (such as relying on automated translation or trusting translation memories too much). Plus, the tools tend to crash a few hours (or minutes) before the deadline, earning us a few white hairs in the process. SDL Studio is unquestionably one of the most popular CAT tools in the market. Unfortunately, though, being such an extensive, all-encompassing tool, it can often intimidate users, many of whom end up using it only to edit and translate files and to save their work in translation memories. This is a waste of potential (and money not-so-well spent). This is why we’ve assembled four of Studio’s most useful but lesser known features; if you haven’t heard of them before, go ahead and give them a try the next time you’re using the tool. Found in the Editor view, under the Review tab, Display Filter allows you to filter segments according to a set of criteria (e.g. only unconfirmed, reviewed, locked or unlocked segments). Just click on All segments and select the option that best suits your purposes. Another useful function of the display filter is that it allows you to search for a certain word or phrase in the source or target and view only the segments containing that phrase. This way, you can make batch corrections of your translation choices in one go or verify you’ve used the same terminology in the entire text without having to use Find & Replace. Any translator or writer who wants to be taken seriously is familiar with Spellchecker and the embarrassment it can save users by spotting typos and basic spelling mistakes. However, a feature less used by translators is Studio’s QA Checker, which in our opinion should be an indispensable companion to any translator using Studio. By clicking Project Settings->Verification, you can access the QA Checker menu and select the types of errors you would like Studio to spot for you (i.e. Inconsistencies, Numbers, Punctuation etc.). If you would like these settings to be the same for all your projects, access the same menu from File->Options. We especially recommend using it to verify numbers and punctuation! This is a particularly useful feature if you often have your translations reviewed by another colleague or if your client sends you a reviewed version of your translation in the target format. This way, you can import the changes in your translation memory and have the segments in their final form stored for future projects. Using it is very easy: In Files view, just select Batch tasks->Update from reviewed target file (Retrofit) and follow the steps of the pop-up menu. Autosuggest’s main role is to save you time from typing and to ensure consistent use of terminology. When you have an Autosuggest Dictionary activated in your project, by typing the first three letters of a word contained therein, you get a pop-up menu with suggestions and you can select the word you were going for. It works wonders when you have to translate texts with the same terminology or when the same words or phrases are repeated several times in your text. 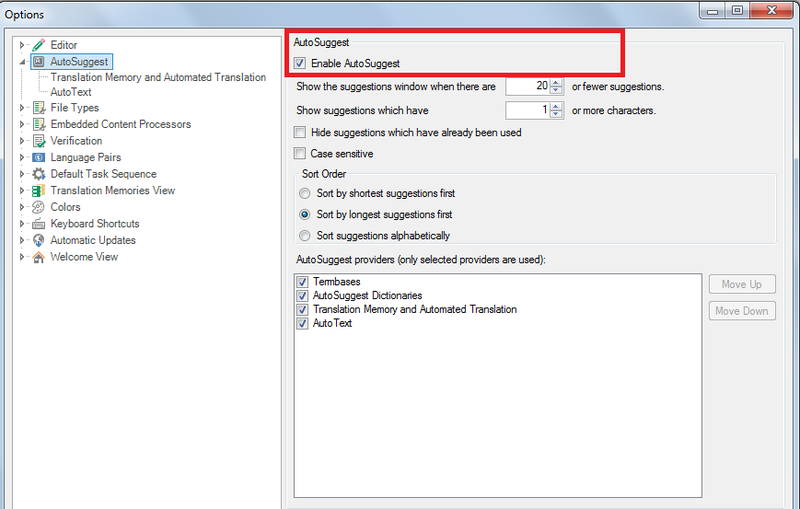 To do this, just go to Translation Memories view and select “Create Auto-suggest Dictionary” from the Home tab. 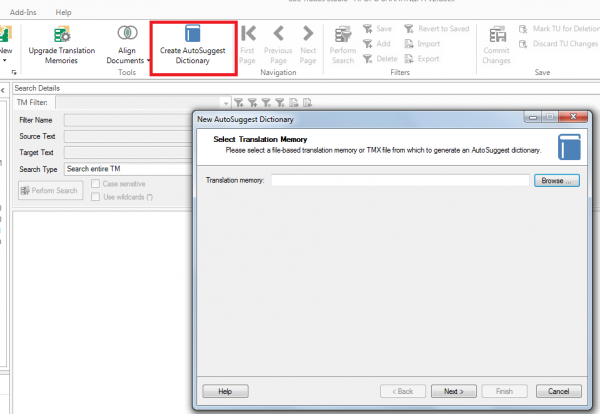 In the pop-up window that will appear, you can select the TM or .tmx file you wish to create your dictionary from. Just beware that you can only create a Dictionary from memories containing a minimum of 10,000 translation units. To use the Dictionary you created in your projects, don’t forget to enable the use of Autosuggest through the File-> Options menu and to add your Autosuggest Dictionary in the Project settings->Language Pairs menu or in the same menu under File->Options if you wish to use it for all your projects. * Autosuggest can also be used with Translation Memories, termbases and AutoText. You can use any combination of these resources for your own needs. However, do bear in mind that too many resources can create “noise” that will probably hinder rather than enhance your productivity! 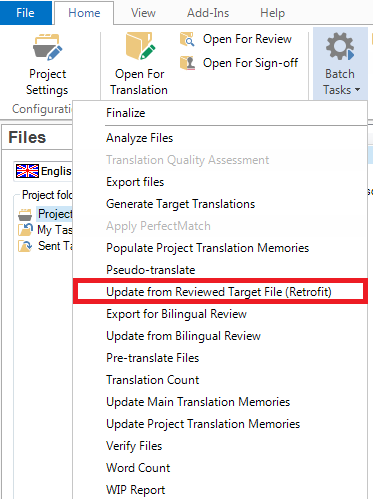 If you have more than one translation memories activated in a given project, you can select the order in which the results are displayed by using the two blue arrows right above their names in the Project settings->Translation Memory and Automated Translation view. You can also penalise results from a specific translation memory (ie give them a lower priority than other results) by inserting a number in the respective box under the Penalty column.